We are innovators in clean and efficient combustion and liquid atomization technology. The Powered Multi-fuel Burner (PMB) is the world's safest and most efficient liquid fuel burner available. It consists of the Babington Airtronic burner and a heating sled, as seen here. 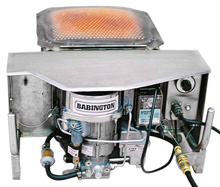 The clean odor and smoke-free flame produced by the Babington Airtronic burner is discharged into the firebox of the heating sled where the final stage of the combustion process is completed. When the burner is operating, only heat and not flame is discharged from the perforated surface of the firebox. The small holes in the top of the firebox serve as an effective means of spreading the heat uniformly as the hot exhaust gases leave the firebox of the heating sled. The PMB assembly was designed to slide into the lower position of an M-59 Field Range, and to perform all of the same functions as the gasoline M-2. All branches of the U.S. Military recognized the need to replace the dangerous M-2 gasoline burner with a safer, more efficient burner system. Unlike the M-2 and other military field feeding burners, the Babington PMB does not have an integral fuel tank. This means the fuel supply is never exposed to the high heat associated with field cooking appliances. As a result, the Babington PMB has no explosive potential. Furthermore, The PMB adheres to the DoD’s decision to eliminate gasoline from military inventories and adopt JP-8 as its “Single Fuel on the Battlefield.” The PMB has the ability to burn ALL distillate fuels cleanly and efficiently without smoke, odor or carbon monoxide from startup to shutdown. This includes JP-8, DF-1 (kerosene), DF-2 (diesel), DF-A (arctic diesel), JP-5 and JET-A. The PMB has passed the rigorous performance testing of Natick Laboratories and the Marine Corps Systems Command. In fact, the Babington PMB was the only M-2 replacement contender to meet the performance specifications in earlier Marine Corps PMB solicitation competitions. It is the only M-2 Burner replacement available in today’s marketplace that offers thermostatically controlled heat, retractable stock pot holders, and NO onboard fuel tank. Because the PMB utilizes the same remote fueling system as the tray ration heater, Marines will no longer be subjected to the explosive hazard created by exposing onboard fuel tanks to the intense heat within the M59 Field Range cabinet. Because the Babington PMB is so efficient, ALL of the M-59 cooking functions can be performed with the burner in the lower position. 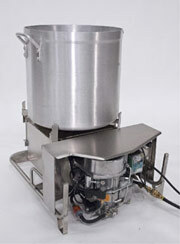 This means that, depending on the product being prepared, the PMB doubles the cooking capacity of the M-59 Field Range. Roasting and grilling can be performed simultaneously. This feature has been successfully utilized at Marine Corps Air Ground Combat Center Twentynine Palms, California since 1996. Fourteen Babington M-59 Retrofits replaced nearly thirty-six M-2 / M-59s in the Camp Wilson Field Mess. This is another example of how the PMB can reduce the mess area footprint and its related lift and cube. The superior performance (e.g., longer mean time between failures) of the PMB over the M-2 has reportedly saved the Camp Wilson Field Mess over $35,000 in burner maintenance costs annually. One of the hallmarks of the PMB is its versatility. The PMB was also designed as a stand-alone heating appliance. In addition to its thermostatic control, the PMB features retractable stockpot holders that can be raised to support and capture a 15-gallon stockpot. The PMB can also be used as the heat source for a thermostatically controlled two-foot griddle accessory. It has 50% more heating surface than the square head lid that acts as a crude griddle in the M-59 Cabinet. 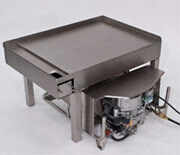 A convenient grease trough and removable waste drawer is also provided with the new griddle assembly. The shell oven has been designed to conveniently and securely sit on the hot surface of the two-foot Griddle. This allows the oven to derive its thermostatically controlled heat from the hot griddle surface. This modular assembly provides full field baking and roasting capabilities without the need for the M-59 Field Range. This shell oven with its removable lid also satisfies NSF standards. 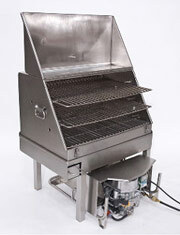 The shell oven can also be configured with a two-spit rotisserie feature. Ultra-low—CO (Carbon Monoxide) less than 5 ppm. The Occupational Safety and Hazard Association (OSHA) allows 50 ppm of CO to be discharged in a closed room. Designed to satisfy the highest safety standards established by Underwriter Laboratories, and the European DIN regulations. The Airtronic Burner was designed for automatic filling from a remote fuel source. This eliminates the potential for uncontrolled fires and explosions that have plagued the M-2 burner. If you would like to request additional information, please fill out our Info Request form. The PMB has passed the rigorous performance testing of Natick Laboratories and the Marine Corps Systems Command.